One of the most nutritious of all greens. Plants are easy to grow, tolerant of heat and cold and very rich in vitamins and minerals. The juicy leaves have mild cabbage like flavor and are delicious boiled, steamed or as an addition to salads. Contains Vitamins A, B and C. The flavor of this wholesome green is greatly improved after frost. 9000 Seeds/oz. Plant 1/4oz per 100ft row. 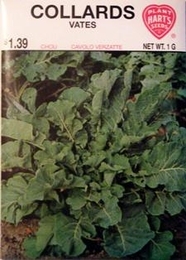 2lbs of Collards seed needed per acre, 4oz needed per acre if using transplants.